"It's a Silent Night Offshore"
"Christmas Marlin Dressed in Plaid"
Share your love of the Florida Keys or your love of Sportfishing this Holiday season". 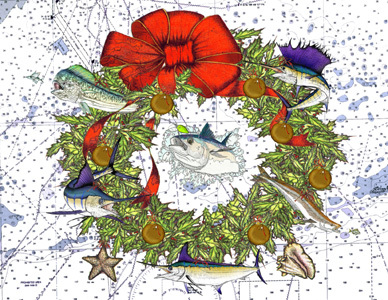 Send our fishing theme Christmas cards. Don't Forget to Browse Chartworks Art Galleries While Your Here. Art Makes a Great Holiday Gift!